This is a few days overdue, but I played in the CalChess Labor Day tournament this past weekend. It doubles as the championship for North California, a state unto itself in the US Chess Federation (Southern California holds it’s own, separate championship on the same weekend). I was largely playing to get some practice playing 2 rounds a day again, as most European events have one round on every day. It was my first time back at the State Champs since 1999, when there were very strong players like GMs Roman Dzindzichasvili and Walter Browne amongst the participants. This year, I was the top seed with about four or five 2400s behind me. Nevertheless, it was an unmitigated disaster for me. In the first round, I had the white pieces against Jimmy Heiserman. He played a Grunfeld against me, and I was rather happy with the game, as I got a small edge out of the opening and started to expand across the board. He tried to complicate things, but I cut my way through the complications to get an easily winning endgame. Annoying for sure, but it was the 2nd game of the day, and as I was trying to prepare myself for the rigors of playing a pair of 5-hour rounds a day, I wasn’t overly upset at that one. The next morning, though, I drew again with a much lower rated master, this time NM Gregory Young. I got a clear advantage out of the opening, but immediately took it into an endgame which offered few practical chances for me due to the opposite colored bishops. This was a bad practical decision, as had I kept more pieces on the board, I may have kept more chances of outplaying my opponent. As it was, the endgame was not so hard to defend, and although he gave me a few chances, I never got close enough to win the game. The real disaster struck that evening, in the fourth round as black against NM Drake Wang. I emerged from the opening with a clear advantage (extra pawn, pair of bishops), but then was so overjoyed with such an advantage that I played a little loosely for the next few moves. I saw a winning line after he played 18.Nxf7, the only problem being that I mixed up the order of the moves. Thus, I incorrectly played 18…d4, when 18…Bxc4 19.bxc3 d3! was winning. He immediately took advantage by sliding his knight away with Nce5, after which I was reeling. I tried to fight, and the game went on for another 2.5 hours, but I was again in no danger of winning and in fact was in no real danger of drawing the game! With that loss, I was dropped to 2/4 and decided to withdraw from the tournament. I had done a great job against lower rated players in general since playing more seriously in 2006 – before this tournament, in my previous 64 games against lower rated opposition (since the start of 2006), I had 55 wins, 7 draws, and 2 losses. In this tournament, I left with 1 win, 2 draws, and 1 loss. A clunker like that was bound to happen at some point, but it was disappointing for sure. However, I think I’ve learned a couple things from those games and will hopefully not let that happen again. The tournament was also costly from a FIDE rating standpoint, as I essentially threw away all my gains from Balaguer 2008 by losing 12+ rating points. My next rated tournament will be the Miami International, from September 10th to the 14th. As a stand-in for a wrap-up of the tournament, my former student FM Sam Shankland won the tournament convincingly with 5/6. He thrashed IM Andrei Florean in round 5 before holding a draw against IM Dmitry Zilberstein in the final round to secure clear first place. HT to my former teacher Richard Shorman for the photos. There are more available at his Chess Dryad site. Round 8: White vs FM Lazaro Lorenzo de la Riva (2367, Spain). I managed to get back in the win column against the only person who beat me in Balaguer last year. That time, though, Lazaro had the white pieces against me. He surprised me with the Benoni as Black, although I expected something new as he doesn’t have many games in the database. I played the Modern Main Line with 7.h3 and 9.Bd3 and he responded with maybe the most theoretical response in 9…b5. This was a bit of a surprise, but a bigger surprise was 14…Rd8. My recollection of this line was that 14…Nd7 was the main move, and that there was some reason 14…Rd8 was not best. I thought for about 10 minutes and played 15.Qe2! ?, which was a surprise for him. As it turns out, 14…Rd8 is reasonably common and usually transposes to the 14…Nd7 line after 15.Bf4. However, 15.Qe2 is an interesting way to play and a viable alternative to 15.Bf4. He played 15…Bf8, after which he was down one pawn, but he had some development advantage and a somewhat awkward knight on e3 to play against. He was just getting more compensation with 24…f5!, but then he threw it all away with 25…Qe4? as the endgame is just lost. Better was 25…Nd6, heading for the e4-square. Round 9: Black vs. GM Alexander Delchev (2618, Bulgaria). Another crazy game against a GM, and again, this one ended in a draw. Delchev is a very solid 2600+ GM, who loses pretty rarely and loses with the white pieces even more rarely. 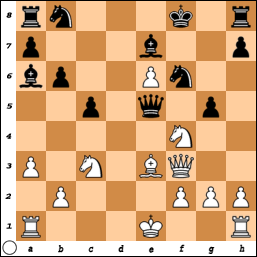 The game was a Semi-Slav Meran with 8…Bd6, although the game left my preparation after 13.Ne2. He said after the game that he has analyzed this position a bit, and thought that white was just better – during the game, I thought it was rather unclear but probably about equal. He soon sent all his pieces to the kingside, and on every move, there was the possibility of f2-f4 or Nh4-f5. With the clocks running down to about 20 minutes apiece, he decided to play it safe with 18.Nf3. This shouldn’t have posed any problems, but a few inaccuracies from me capped by 24…Qe7?, left me in a difficult position. He played two very strong moves with 25.Qf4! 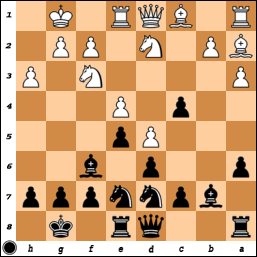 and 26.Nf5!, after which black’s position looks extremely shaky. However, I was confident in my defensive chances and I didn’t see any win for him. As it turns out, neither did he. I consolidated the extra piece and with 39…Rf5, I would have sealed the win. But alas, I played 39…Qc5, which threw the win away as I had missed 44.Bg4. With the cold, objective analysis of a computer, it turns out his sacrifice with 26.Nf5 is winning, but he has to find a series of amazing moves – 30.Qh4 (instead of 30.Qf5) Kh8!? 31.g3!!. While somewhat logical ex-post, it’d be hard to find many chessplayers who could find such moves with a minute on their clock. Round 10: White vs. GM Levan Aroshidze (2547, Georgia). This was a particularly tough pairing for me (and for Levan), since we have roomed together at a few tournaments since last year. It’s never easy to play a friend. The game itself ended in a draw, although not quite like it may have been expected. The opening was not something either of us prepared for (I pretty much always play the IQP positions of the Rubinstein Nimzo) and I was on my own after 10…b6. He then offered a draw with 13…Rfd8, which left me thinking for 20 minutes about what to do – play on or just take the draw? In the end, I decided to play on, as my job now is essentially to play chess and get better. A draw wouldn’t have risked anything in the tournament, but at the same time, after going all the way to Spain, it made some sense to play on given that it wasn’t a GM norm/title on the line. My idea with 15.e4, 16.e5 and 17.Qg4 looked dangerous, but Levan found the correct series of moves to diffuse the tension. If, instead of 20…Qc4, he played 20…Qb3, then 21.dxe6 Qxa2 22.Nf5! g6 23.exf7+ is the point (if 23…Qxf7, 24.Nh6+). If Black steps to h8 with king, then 24.Qb4 is crushing. In the actual game, the endgame after 24.d6 is rather hard to assess – Black gains control of the c-file, but the d6-pawn is a serious asset. 24…f6 was the safe way to play and liquidated the central pawns and the game petered out to equality after which I offered a draw which was quickly accepted. So, after playing an extra 2 hours or so, I was back at square one with a draw. But the game was still a useful one to play, I think. After the game, Levan actually apologized to me for offering a draw, saying that he couldn’t bring himself to play the game seriously and so offered a draw even though he had the black pieces. I didn’t mind that at all, actually, but I explained why I wanted to play on a bit. In the other games, Baklan beat Fidel Corrales and so passed him for first place with 8/10. The top two Cubans (Corrales and Bruzon) shared 2nd-3rd at 7.5/10, and there was a 10-way tie for 4th-13th at 7/10. Unlike in Benasque, number of wins was not the first tiebreak (it was the 5th) and my opponent’s score as calculated by the Bucholz metric was the 2nd best amongst my group. Thus, I finished in 5th place on tiebreaks. For what it’s worth, had number of wins been used as the first tiebreak, I would have finished last! I didn’t quite make a GM-norm equivalent performance in Balaguer though, as the performance was only about 2572. Still, it was a solid performance and I managed to gain about 12 points. So after Benasque and Balaguer, my two tournaments of the summer, I should be sitting on 2512 FIDE or so. Well, since the fourth round, I managed to get 2 points from 3 games. The first two games, though, were not particularly clean, although the third was a bit better. Round 5: Black vs. WFM Keti Tsatsalashvili (2271, Georgia). An odd game from the start. The Benoni is not part of my normal repertoire (I’ve only tried to play it twice over the past 10 years in rated play, and in both cases, my opponent didn’t let me play it!) and I had no games of my opponent against this opening. Still, I decided that since the Benoni angles for a fight from the start, it was the remedy I needed to get back on track. Keti started off with the Knight Tour Variation with 7.Nd2, but then got back into a Fianchetto Variation with 8.g3. 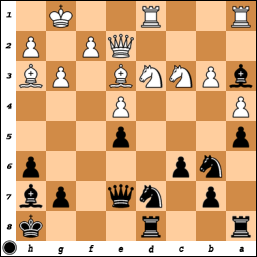 Black’s position was actually quite comfortable after 12…Ne5 and 13…Nh5. However, instead of 13…Bd7? !, I should have played 13…f5. I had seen this move, but I thought by threatening …b5, I could get her to play a move like Rb1, after which …f5 would have even more effect. However, I never got a chance to play …b5 and …f5 was a defensive measure when I got to play it. After 17.Nc4 Qc7, White’s position looks amazing at first glance but it’s not so easy to figure out how to make full use of the advantage. In the game continuation, I sacrificed a pawn because I didn’t see anything better to do after 18.a5, but White has some technical difficulties to keep the pawn, as her knight on b6 is completely out of play. In addition, the bishop on c1 is temporarily tied down to the defense of the b2-pawn, and she must watch out that I don’t get a rook to e2 or capture the d5-pawn. The way she played managed to temporarily avoid losing the pawns or allowing a rook in, but all of Black’s pieces became very active and after 27…Re4, Black is better. It was only a matter of time before I crashed through, and with 40…Nd4!, won the game. Round 6: White vs. GM Lazaro Bruzon (2582, Cuba). An amazing save, if I may say so myself. In the database, Bruzon had essentially only played three different systems against 1.d4 – (1) the QGD, (2) the Nimzo-Indian, and (3) the Semi-Slav Meran with the rare 8…b4. I was ready for all those, although I had expected him to play a Nimzo. 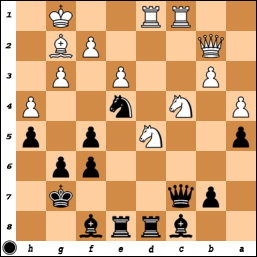 However, he trotted out the Meran and then played 8…Bd6! While I had faced this once before this summer (against Eduardo Desanjose Candalija), I had not studied it too carefully since then, and even if I had, I probably would not have been ready to meet his natural novelty of 11…a5. I sunk into thought and was unable to find anything good to do, and in fact, got a worse position in trying to play for some advantage. 19.Rd1 was a mistake in view of 19…g6! To compound my troubles, I was down to about 4 minutes to his 30 minutes. 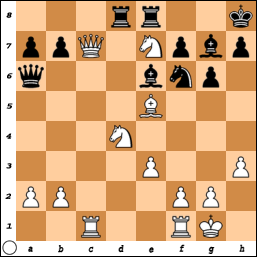 In the complications that followed, I managed to find some good moves and missed one good one (26.Qxb3! instead of 26.Qd2? ), but Lazaro was unable to put me away there. To avoid some nice checkmates after 29…Nf5+, I had to sacrifice my queen, but the Q vs 2R endgame was not a trivial win, especially as his clock was ticking down. In the end, he had to repeat the position to avoid a worse fate (if, for example, my pawn gets farther down the board, maybe I can even think of playing to win). The computer would, of course, had a field day with the middlegame attacking position. I’m not quite sure what to make of the endgame, but given the time control, it was difficult to play properly. The original time control for the tournament was 40/90 + G/30, with 30 seconds added per move. However, for reasons unknown, it was changed the same day as the first round. Round 7: Black vs. GM Vladimir Baklan (2630, Ukraine). This game was a bit of a missed opportunity for me. Baklan is the top seed in the tournament, but I let a bit of an advantage slip. 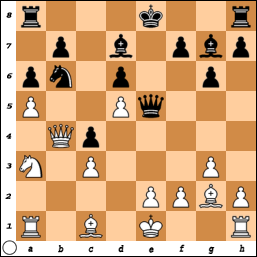 The game featured the Worrall Attack of the Ruy Lopez with 12.d5, a line I had spent all of 5 minutes preparing for. As this was my first time on the black side of such a Ruy structure, I took a bit of time, but I hit upon a few somewhat standard ideas. Actually, after 19…c4, I was even a bit better, but then I played 22…Na5?. I think I should have played 22…Nc5 instead, but for some reason, I reacted instantly with …Na5. After 23.g5 Nh5 24.Nxh5, my position is probably alright, but it’s gotten a lot more unclear. I had a shattered kingside pawn structure, and a rather bad bishop on g7, but I did get a pawn on h3 as compensation in addition to the trump of my queenside passer. The 10 minutes I spent on 27…a5 was a key moment in the game, as it was during that think I realized that the way for me to keep playing this position was to push the a-pawn. Black has two ideas there – one is just to push the a-pawn all the way, the other is, if the pawn gets exchanged on a4 for example, is to take back with the rook, followed by doubling on the a-file and the 4th rank (with …Qc4). Still, the pawn push only kept the position rather unclear, and in mutual time pressure, the game simplified into an endgame that I probably should have kept playing. Instead, I decided to call it a day and accepted his draw offer. So after 7 rounds, I have 5 points. IM Fidel Corrales Jimenez of Cuba is leading the tournament with 6.5/7. He crushed GMs Delchev and Aroshidze the past two rounds, and is the first person I’ve seen beat Delchev in Balaguer in the last 3 years! Round 1: Black vs C.P. Aatirah (1946, India). An easy game to start off the tournament. Since first round pairings only go up right before the game, there is no time for preparation. As a result, I went with what I know best (and what angles for a fight from the start). 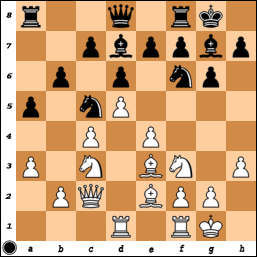 I played the French Defense, and after the Advance Variation, my old favorite line of 5…Nh6. Black’s pieces all went to their best squares right away, and in some sense, it was a textbook demonstration of what Black should be trying for in this line. Round 2: White vs Boris Bruned (2224, Spain). A protracted struggle, with most of the problems for me coming in the opening phase. I had not prepared much for this game, although it would have been useful for me to have done so. I played a Trompowsky, and we followed a game of mine against Kruttika Nadig from Andorra 2006 for a little while. While I managed to win that game, it was not because I came out ahead from the opening struggle, and I spent a lot of time at the board trying to figure out what the improvement was supposed to be. In the end, I hit upon an interesting idea with 9.Nh3, 11.Nf4, and 12.Bh3. After the opening, my opponent started to think a lot more and soon came to the realization that his opening plan did not solve the problems of his pawn structure, especially with the pawns on e7 and f7. In the end, those pawns cost him the game, as he was going to lose one for sure after 27.Qd3. The endgame was lost, but he then lost on time after 38.b4. Compared to the past two years, the tournament is marginally stronger this year. While the ratings of the top players are about the same, the bigger difference is that there are fewer lower rated players (especially in the 2000-2100 range). In the past two years, I faced players rated 2167 and 2182 in the 2nd round. And last year, despite have a lower rating, I was essentially the same seed. Round 3: Black vs Jose Luis Vilela (2347, Cuba). The game finished as a draw after only 14 moves, but it took almost 3 hours to play! Again, I did not spend as much time preparing for this game as I would if I was playing without the accumulated fatigue of a previous tournament. As it was, he played the Slav Exchange (like Levin did in Benasque). I had actually expected something else from him even though he had played this line a few times. He continued with 4.Nc3 and 5.Bf4, so I played 5…Qb6. 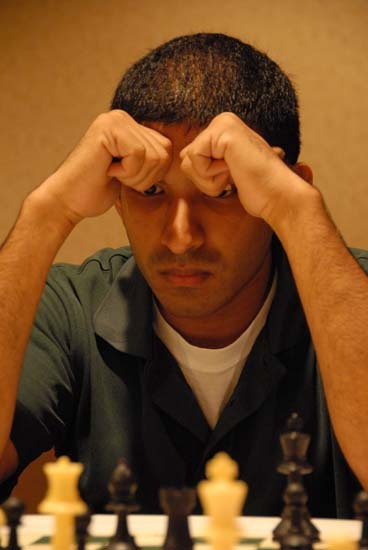 He then sank into thought for about 30 minutes before playing 6.Rc1 (one of the more testing moves in my opinion). Not remembering the theory here, I decided to avoid taking the pawn on b2 (after a preparatory 6…Nc6, for example) and instead played 6…Bf5. He then thought for another 15 minutes and played 7.Na4. And then I sat down for about 45 minutes before playing 7…Qa5+! 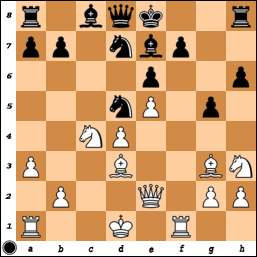 The first problem for me was that I had completely overlooked 7.Na4, despite it being a rather obvious move. The second problem was that I realized it was a good move. I spent a lot of time calculating variations after 7…Qd8 8.Qb3 Nbd7 9.Qxb7 e5! (angling for an eventual …Rb8 and …Bb4+) and 9.Nf3! Ne4!? 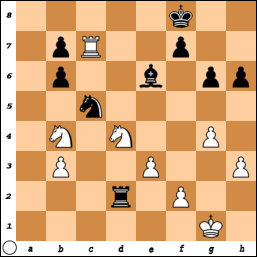 with similar traps in mind based on the a5-e1 diagonal. In the end, I realized that 9.Nf3 was quite strong for white and gave up on this line. In the game continuation, White missed a strong line with 9.Qb3 (instead of 9.e3), which would have secured a small advantage. As it was in the game, I had a nice trick with 11…a6!, covering the b5-square. Even though it drops the d5-pawn, it’s only a temporary loss since I get the a2-pawn back after 13…Be6. Down to less than 20 minutes, Vilela offered a draw with 14.Qa5 and I saw no reason to decline. Round 4: White vs Yvain Bruned (2383, Spain). Thanks to a healthy dose of good fortune, I managed to escape this game with a draw. It was a bit weird to play Boris’ twin brother in the same tournament as they play the exact same set of openings. Thus, I was not likely to repeat the Trompowsky, but I had to decide what to do against the Nimzo. He deviated from his usual patterns in the Rubinstein Variation with 4…0-0 5.Bd3 d5 (rather than the 4…c5 he had played in every game from that position in the database). He immediately made a misstep though with 7…Nxd5? instead of 7…cxd4. However, I played too hastily with e4-e5 and threw away a huge advantage and then had to try and stir up trouble on the kingside without any obvious weakness to attack. I got into huge time trouble in this game, down to about 4 minutes against more than an hour, but managed to pose enough problems to trick him into a draw. Actually, he blundered with 27…a5?, which loses to 28.Bxh7+!, but for some reason, I missed the only threat I had in the position. Then I hit upon an amusing idea of 37.Qg2, aiming to throw the h-pawn into the fire (the only piece that could attack but hadn’t yet done so). He then blundered again horribly with 42…Kxh7, although neither of us realized that 42…Kh8 was immediately winning! After this game, the Bruned family is on the board against me. I had beaten Yvain in Andorra 2006, Vianney (the youngest brother) in Balaguer 2007, and Boris in Balaguer 2008. Hopefully I play better the rest of the tournament – the past two games have featured some pretty poor chess on my part.